When we shine a light on our previous success we find the motivation we need to continue to be successful. 2. Success has to KEEP happening. 3. We don’t always recognize success when it happens. We’re pretty hard on ourselves. Good gyms provide access. Great gyms provide success. That means we prioritize our PR board over our scoreboard, we celebrate every small success with each other, and we need to take five minutes every week to reflect on the GOOD in our lives. The practice of thankfulness doesn’t come naturally to anyone. That’s why we call it a practice: it’s hard, we don’t feel like doing it–and then we feel better once we have. 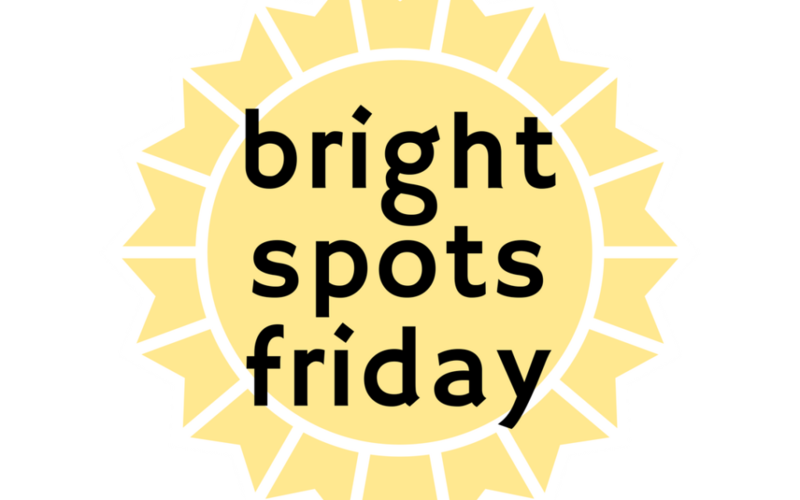 “Bright Spots Friday” is our practice of thankfulness. Every week in the CFRV group, we’ll post our “Bright Spots”: things that went right, things we’re celebrating, and little ‘wins’ from the week. Bright spots aren’t always directly workout-related (“I got an award at work for being the best in my field!”, or “My Kid performed in the school play and absolutely crushed it!”) but practicing gratitude and thankfulness IS an exercise. So, I’ll go first. And I encourage you to follow with one TINY little Bright Spot. Make it work out related to start, if that’s easier. What did you do RIGHT, or do BEST, or do for the FIRST time this week? Share in the CFRV Members FB Group. We’re all family here. It’s a safe place. Look within, and start your weekend happy! There is no replacement for hard work. As new years resolution motivation fades remember: there is no replacement for hard work. When the new thing pops up promising all the results in half the time remember: there is no replacement for hard work. If you are frustrated that the weight gained over the past 5 years isn’t coming off in a matter of days remember: there is no replacement for hard work. Hard work will carry you though when motivation begins to fail. Hard work will get you to your goal, in the time it takes, depending on the amount of work you put in. Hard work will help you to lose the weight, build muscle, and be the fittest you possible, but it isn’t going to happen overnight. Anything that any other person has achieved you are capable of achieving also. You can run a 5k, you can run a marathon, you can run a 100k race if chasing these goals lights a fire in your belly, and you are willing to put in the work. You can wake up at 4:30am to workout, you can meal prep ahead of time, you can count your macros, if doing so is worth the sacrifice, and you are willing to put in the work. …all you have to do is put in the work. If you need help creating a plan to reach your goal, message me and I will help! According to the law of accommodation, our biological response to a constant stimulus diminishes over time. In other words, if we stop changing our training stimulus (introduce new stress) our progress will begin to greatly slow down. Our bodies respond to stress, read: The Science of Change: Pt. 1 The SAID Principle. If we stop increasing our training stimulus with new, constantly varied, forms of stress, then our bodies will accommodate, i.e. stop changing. It is easy to create change when we are new to working out. A person who changes their routine from being completely sedentary to running 5-10 miles a day will initially get better at running, lose weight, and feel great. Their bodies will adapt to the new training stimulus in a lot of amazing ways. But, if this person continues to run 10 miles every day, with no changes in their training stimulus, the athlete’s progress will begin to greatly diminish, until their body stops adapting to running 10 miles every day. What a waste to run 10 miles every day, to spend all that time, effort, and energy with no significant increase in your fitness for all your work! It’s easy to see the law of accommodation apply to other areas of our lives as well. If we stop challenging ourselves in our careers, our jobs can get kinda boring, and we can lose interest. Our improvement in our work can decline, and we lose the joy we initially had in our professions. If we want to make changes in our life, we have to change our behavior. If we want to continue to grow, in any capacity, we need to constantly seek out new ways to grow. If we stop looking for new ways to grow, we stop growing. In training this means we need variation, often by increasing the intensity of our training stimulus: lift heavier, run faster, jump higher, etc. Or by focusing on the other factors that affect our training: nutrition, sleep, hydration, etc. For our careers, we have to explore new challenges: to take on different tasks and roles in our companies, to mentor others in our trade, to create new visions for the future of our fields, or even to change careers altogether: to evaluate our best strengths, and to find a job, or start a business, where these strengths are brought to life. If we continue to repeat the same behavior in any aspect of our lives (physical, mental, spiritual, relational, etc) we will slow our growth in these areas. We must continue to seek new challenges. To push ourselves to find the limits of what we are capable of today so that we can grow into who we are meant to be tomorrow. Consider an area of your life where you have stopped making growth. Whether it is in your health & fitness, finances, relationship(s), professional career, recreational activities, etc. How are you actively seeking to change your behavior in these areas, so that you continue to find new growth? Are there aspects of your physical fitness you have stopped making progress in? Schedule a Goal Review today to see where we can make changes to your training to help you reach your goals faster! SAID stands for Specific Adaptations to Imposed Demands. The SAID Principle explains how we get strong (adaptation) through stress (imposed demands). When we put our bodies through a stimulus, we stress our bodies, and our bodies adapt to grow stronger. This process works as long as the initial stress is not so great that instead of repair & rebuild we get injury, and then a much longer repair & rebuild stage. If we want a stronger back squat we lift heavy things to create stress (probably we do a lot of back squats and accessory work), we wait until our bodies repair themselves (proper sleep, nutrition, hydration, mindfulness all help here), and we adapt to grow stronger over time. This works with pull-ups, running, burpees, etc. If we want to get better at these things, we need to do more of them, to keep increasing the stimulus to expose ourselves to more stress, so that we can continue to adapt and grow stronger. What I find fascinating about the SAID principle is how it applies to every facet of our lives. Take relationships: relationships grow through stress as well. Imagine dating someone and within 1-2 weeks coming to find out they have a major problem with substance abuse. It’s going to be difficult to really be there for them and help them through it. I mean you barely know the guy/gal. Your relationship is the equivalent of a train wreck air squat. If someone throws a 30-lb medball at you, you’re more likely to get a hernia than to do anything useful with it. But imagine a marriage that has lasted 10-20 years. If your significant other has a major problem you are going to be much more capable of being there for them and helping them through it because of all the little stresses you have been through along the way. These mini stresses: overcoming financial issues, building a home together, and the myriad of mistake making along the way has created a much stronger relationship that is more capable of handling bigger stressors. Your relationship is now the equivalent of a 500-lb back squat. If someone throws a 30-lb medball at you, you start doing 150 wall balls for time, you go for a mile run with it, use it for weighted sit-ups—the point is you are strong enough to handle it. We need some stress in our life to grow. Stress is not something to shy away from, it is the path that leads to our greater development. But, we must use it wisely, in moderation, and specifically so that we continue to grow into our authentic, best selves. If we keep exposing ourselves to adequate amounts of stress, no matter which area of our life we are working on, we will adapt and grow stronger. Are there areas in your life where you are not advancing, and you need to add more stress in order to grow? Are there areas in your life where too much stress is causing a problem? Are the areas where you are applying stress specifically chosen to help you to reach your goals? Stay tuned for Pt. 2 of The Science of Change: The Law of Accommodation! Choose How You Want To Feel. Set Goals That Allow You to Feel This Way. One day, while catching with my friend Becky over a cup of coffee, we were talking about our goals for the future, she introduced a concept of goal setting that was new to me. Before Becky decides on her goals she decides how she wants to feel. Then, she works backwards: she creates goals that will allow her to feel this way. Knowing how we want to feel, and the goals we need to accomplish in order to feel this way is really powerful because: choosing how we want to feel allows us to choose the right behaviors that will lead to our desired outcome. Cindy goes into the office and once again are her favorite Dunkin Donuts sitting in the pretty pink box, just like they are everyday. There are days she has the willpower to walk away from the donuts……but after a few days……her willpower caves and she eats the donut she’s been craving. She walks away happy for a few minutes, until the guilt sets in. The negative thoughts start flowing of how she’s worthless, and no wonder she can’t lose weight. Cindy has a vague goal of losing weight but she’s never really thought about how she will feel when she loses weight. She hasn’t thought about what it will feel like to become the best version of herself. And so the feeling of instant gratification becomes the story of her life. Throughout the day we we have to make a dozen decisions that affect the story of our lives. For each decision, we generally have two roads that diverge, and we need to decide which road to take. I can behave in a way way that makes me feel good now, but the feeling is short lived. I can behave in a way that is difficult now, but it will allow me to get one step closer to my goals. If we imagine walking down both roads, if we imagine putting ourself into both future scenarios: one where we take the easy road and one where we take the hard road, we can imagine how choosing either road will ultimately make us feel. When we imagine how we want to feel after we accomplish our goals, and when this feeling is stronger than the feeling of instant gratification, we more often take the path that’s leads us toward our goals, we become more successful. First: We have to imagine how we want to feel. Second: We can create goals that support feeling this way. Third: We can live into our dreams each day by imagining we have already accomplished our goals and how this makes us feel. Adopting this behavior, by turning it into a daily habit, allows us not to be swayed by the easy road, the short road, the Dunkin Donuts, the road that gives us instant gratification. But instead, to take the road that will lead us to become our authentic selves. To live and feel the way we want to feel, to grow into our greatest potential. The following post was written by Coach Jessie Ingram to help you get through the grind! In the first 2 months of doing nutrition coaching, Sara dropped 3 % BF, was consistently meal prepping, eating meals at home, measuring her portions, avoiding alcohol and was logging in MFP everyday!! She was feeling great about her progress! Then over the next 2 months, Sara’s progress had stalled. She has been thrilled about her new found energy, her deadlift PR and the healthier food choices she is making overall. But she hasn’t seen any changes in her clothes or continued fat loss. She admits to sneaking bites of her kid’s snacks and eating out more on weekends. She hasn’t been logging as consistently in MFP as when she first started. Her actions started not to line up with her goals. Sara is like many people when they start the process of making changes to their old, undesirable habits. In her case, her nutrition habits. She started off very motivated, determined, and focused. Overtime though, the “Grind” set in. Real life happened and the desire to go back to old habits prevailed. The Grind is a tough spot. It’s after the “honeymoon” phase has worn off. It’s where the real work begins. When you enter The Grind you realize: Now you have to do these things over and over and over again. Ho hum. It’s not the sexiest stage of change, but The Grind is good. The Grind gives us time to think. Time to evaluate. Time to practice. In The Grind, we don’t have to think about how we’re going to do things. We know by now how to pack those containers with our protein and veggies, how to cook broccoli, how to make it to the gym. So while it might seem like The Grind is a time of boredom or struggle, it’s actually a time of INCUBATION, PRACTICE, and MASTERY.� You have time to reflect on who you’ve become, and what you really want right now. • Do more of what you know works for you (meal prep, log in MFP, avoid alcohol or eating out, etc). • Remember WHY you got started in the first place. Your WHY is your single strongest motivator (even if it changes throughout life). * Continue working on positive self talk, good sleep, and consistent work outs, drinking water. • Give yourself grace. Understand that you don’t have to be perfect 100% of the time, but that 50% won’t get you to your desired outcome either. The Grind happens to us all. It’s what we do about it that determines our outcome!! If you need help getting a personalized nutrition game plan, schedule a meeting with Jessie to get started today! Kai = Change. Zen = Good. Focusing on incremental, consistent progress (a key tenant of Kaizen) is the cornerstone philosophy that made Toyota a Titan of the auto industry. By meeting with small teams regularly to identity, analyze, and solve problems Toyota was able to focus on the processes to ensure they produced their desired end result. By analyzing the process and making constant incremental changes they improved the total quality of work. By improving the total quality of work they improved the end product. Although the Kaizen method is specific to business management, their is a lot we can glean from these ideas to improve our physical, relational, mental, and spiritual selves. 2. Abolish old, traditional concepts. 3. Accept no excuses and make things happen. 4. Say no to the status quo of implementing new methods and assuming they will work. 5. If something is wrong, correct it. 6. Empower everyone to take part in problem solving. 7. Get information and opinions from multiple people. 9. Be economical. Save money through small improvements and spend the saved money on further improvements. 10. Remember that improvement has no limits. Never stop trying to improve. Let me know what inspiration sparks in you from the art of Kaizen! Or how you already use Kaizen principles to better your life. Shoot me a message if there are areas you are struggling in, areas where you recognize implementing the art of constant improvement might benefit you. Recently I reached out to an athlete who has been MIA at the gym. She told me her story of how working again, and working on home repairs (on top of being a wife, and mother to two little ones) has made her life a little crazy. Because of these circumstances she has not found the time to make her fitness a priority. Life is messy. Circumstances change. And, from time to time, prioritizing our health and fitness may need to get put on the back burner. If you are in a season of life where you need to prioritize your family, your career, your home, etc. over your health and fitness goals make sure to acknowledge why you are prioritizing these things, and the benefit you get from spending your time on these things. Knowing your priorities are in the right place, you can give yourself grace for controlling what you can control, for doing what is right for your situation, for knowing that you are temporarily giving up something that is important to you (health and fitness) for the right reasons. Have a Plan to Get Back. You are worth being your best self. You are your best self when you feel healthy and vibrant, when you are confident in how you look and feel. If you are reading this blog, you probably already know that exercising and eating healthy are necessary for you to be your best self. You know that your relationships are better when you are your best self. That you are a better boss/employee/co-worker when you are full of energy and confidence. You know that your family thrives when you are your best self. Have a plan to reprioritize working on your health and fitness. Think about what has worked for you in the past. Start small. Give yourself grace when you start back up. Leave your ego outside the box, and focus on the joy of working out, getting sweaty, and working on being your best self again. What Can You Do During This Season? Instead of abandoning all hope, and waiting until (next week, next month, next season…) to bring health and fitness back into priority in your life, think about little things that you can start doing now to continue to work towards your heath and fitness goals. What can you do to work on your nutrition? Are Stuck in This Season? 1. Why is working on my health and fitness important to me? 2. If I stay in this season of not prioritizing my health and fitness for too long, what do I risk losing? When you honestly answer these questions, you have taken the first steps to finding your way back. Being fit and healthy requires us to prioritize some of our time to the endeavor. But you are worth the investment. You are worth looking and feeling your best. You are worth being fit and healthy. If you are ready to get your sanity back, and get back into working on your health and fitness goals, take the next step and book a “No-Sweat” intro with me to get started. This is the story of the Vegas Golden Knights. This is the story of how the right people placed in the right environment can bring to life the stuff of legends. And this story, perhaps the most unbelievable in the history of professional sports, is happening right now. The Vegas Knights is a team of misfits. An expansion team brought together for the 2018 Hockey season to become the most successful first-year franchise in the history of the NHL. In fact, they are the only team of the 64 expansion teams in the four major US sports leagues since 1960 to debut with a winning season. A team no one expected to win, the Knights began the season with 200 to 1 odds against them winning the Stanley Cup (the longest odds against in the NHL). And yet, already having defeated two teams in the playoffs, are headed next week to the Western Conference Final. What is the secret of their success? The magic behind their meteoric rise? I would argue that in this instance excalibur isn’t a magical sword but an environment created by the right combination of people. That, in the right environment, supported by the right people, ordinary people become legends. What else can explain the difference between William Karlsson’s abilities this year compared to previous years? Karlsson is the Knight who was previously discarded by two teams in his first three seasons. The Knight who last year scored just 6 goals. The Knight who averaged a career shooting percentage of just 7.7 percent. This year, on a different team, supported by different people, surrounded by a different environment, William “Wild Bill” Karlsson has stacked 43 goals with a 23 percent shooting percentage. A record breaking, history making performance that is so far and above what he has previously shown to be capable of there is little logic to explain it. What else can explain the redemption of Marc-Andre Fluery? Fluery is the knight who shined in 2009 as Goalie for the Pittsburg Penguins but has been lackluster ever since. The knight who was demoted to a backup goalie. The knight who benched last year after a four goal disaster and would not take the net again before being dropped by the Penguins. This year, with the support of the Vegas Golden Knights, the 33-year old veteran Marc-Andre Fluery finished the season with a career best performance including a regular season save percentage of .927. Excalibur, may be a legend, but the Vegas Knights have found that the right people can create an environment of success that is nothing short of magic. If we want to transform like Karlsson that we too may reach our full potential we too need the right people in our line. To surround ourselves with people who support us and help us to reach our goals. If we want to get back on top like Fluery we need to focus on our contribution to the success of the team, to constantly ask what can we do to help the team, to put the team’s success at the forefront of our thought. If we want to be our best selves we need to surround ourselves with the right people, and help to create an environment where everyone can be successful. This is the magical combination. This is the stuff legends are made of. As a High School Coach for 12 years I was privileged to coach many different kinds of student athletes. One of the biggest difference makers that allows athletes to be more successful is when they learn to be more than motivated—when they learned to be dedicated. Motivated athletes practice hard when they are motivated by a big game approaching. Motivated athletes practice hard when they are motivated by a coach watching them. Motivated athletes practice hard when they are motivated by their mood. But, athletes who rely on motivation to succeed often experience a roller coaster effect where, when they aren’t feeling it, they don’t show up to practice hard. Dedicated athletes practice hard every day. Dedicated athletes are driven by a purpose. Their purpose helps to form their character. Their character shapes their thoughts. Their thoughts shape their actions. And their actions drive them toward their goals. There’s nothing wrong with motivation, motivation is great. It can help us get us to PR we have been chasing, help us to start new behaviors, or help us to get back on track if we have fallen off the wagon. It feels good to be motivated, and our good feelings fuel our motivation. Motivation is a tool that, for short periods of time, allows us to use our state of mind to direct our behavior toward our goals. Dedication allows us to be successful even when our motivation runs dry. Dedication allows us to put in the work every day, driven by our purpose, knowing that in the end it will be worth it.